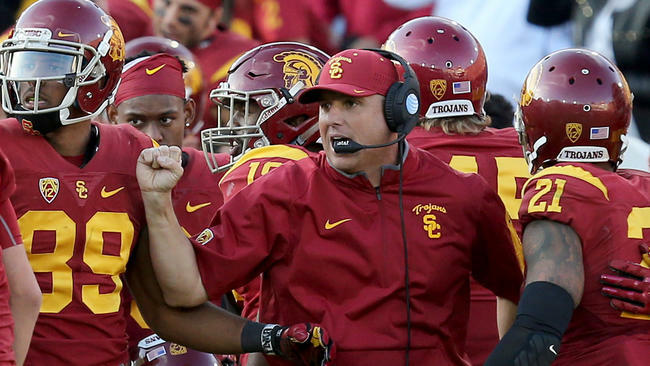 Shirts With Random Triangles: USC Promotes Clay Helton To Permanent Head Football Coach. In a statement released by the school, USC athletic director Pat Haden explained the decision to stick with Helton rather than hiring a new head coach from outside the program. “We have known Clay well for the past six years. He earned this opportunity. He has been positive and upbeat handling adversity. He was built to be a head coach. Football is his family business. He is a coach on the rise and he will be coaching a team on the rise. As our interim head coach, Clay brought back USC’s style of physical football. I have been impressed with how hard and how inspired our team has played for him, as well as the support they have shown for him." USC has a 5-2 record since Haden took over for the fired Steve Sarkisian. It will be facing Stanford in the Pac-12 Championship Game this coming Saturday.